The Ny Carlsberg Brewhouse (Danish: Ny Carlsberg Bryghus) is a historic, listed building in the Carlsberg district of Copenhagen, Denmark, on the border between Vesterbro and Valby. The Ny Carlsberg Brewhouse was built by Carl Jacobsen as the new brewhouse of his Ny Carlsberg Brewery which he had founded after a conflict with his father, Carlsberg-founder J. C. Jacobsen. It was designed by Vilhelm Klein and completed in 1901, replacing a smaller brewhouse still to be seen on the opposite side of the road. The new brewhouse complex also included a straw storage house to the east and a hops store with a yeast cellar to the west. In 1920 the brewhouse complex was extended northward by Carl Harild and then altered in 1949 and 1965. Later, when the facilities became outdated, the buildings were put to other use. In 2006, Carlsberg decided to close the Valby brewery and instead redevelop the area . In 2008, the year beer production on the site was discontinued, the brewhouse became a listed building. In early 2011 it was stripped of its inventory and most of its furnishings to prepare it for other use. The Ny Carlsberg Brewhouse is built in the Historicist style which also characterizes the rest of the Carlsberg area. 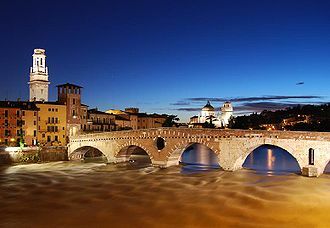 The main source of inspiration comes from Italian Renaissance architecture. 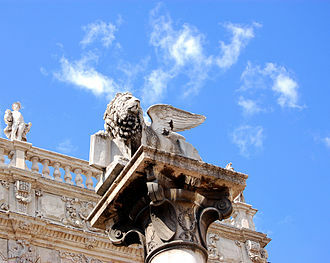 The building's facade with its balcony is inspired by Palazzo Bevilacqua in Verona. On the roof stands Carl Johan Bonnesen's large group sculpture "Thor's battle against the Jötunns". The group of figures was originally a competition proposal for a monument at Langelinie which was won by Anders Bundgaard's Gefion Fountain. Carl Jacobsen subsequently asked Bonnesen to produce a copy for his new brewhouse. ^ a b "Referat". Det Særlige Bygningssyns. Retrieved 2011-04-06. ^ "Bryghus tømmes for indmad". Carlsberg. Retrieved 2011-04-06. ^ "The Brewhouse". Carlsberg. Retrieved 2011-04-06. Wikimedia Commons has media related to Ny Carlsberg Bryghus. 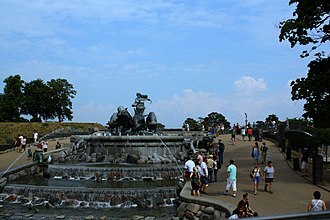 Langelinie is a pier and park in central Copenhagen and home of the statue of The Little Mermaid. 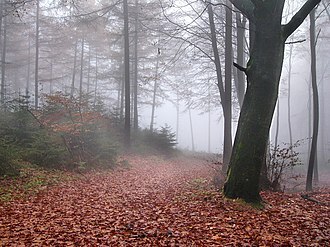 The area has for centuries been a destination for excursions. Most cruise ships arriving in Copenhagen berth at Langelinie Pier, for a long time, the stretch was a military area where civilians were not granted unrestricted access. Under a general order from 1819, soldiers were required to throw water in the head and on the breast, eventually a beach promenade and a park for the Bourgeoisie were made but with access only on the payment of a toll to keep the more common people out. Not until an uprising in 1848 did the area become open to everybody. The expansion of the city and the increasing industrialization soon made it clear that the harbour was becoming too small. In a plan from 1862 it was decided to dig out the area to access for the largest ocean-going vessels. A suggestion to make all of Amager into a zone was abolished. The beginning of the work was prompted by Germanys construction of the Kiel Canal that was begun in 1887, in 1894 the work was completed and Copenhagen had got an entirely new harbourfront. The Meatpacking District is a district of Vesterbro in Copenhagen, Denmark. It is situated between the lines going into Copenhagen Central Station and the street Sønder Boulevard. The modern English-language name Meatpacking District is taken from the Meatpacking District in New York, the district consists of three separate areas, referred to as the White and Brown Kødby for the dominant colour of their buildings. The brown part is the oldest area, closest to the Central Station and it has since c.2000 been changed into a new creative cluster with galleries, art cafés, nightlife and small creative businesses like studios and architecture firms in the historical buildings. It is home to DGI-byen, a sports and conference complex, the newer white area is a 400 ×600 m enclave of white modernistic structures, built in 1934 to the design of city architect Poul Holsøe. A municipal master plan aims at creating an area, encouraging cultural, design. 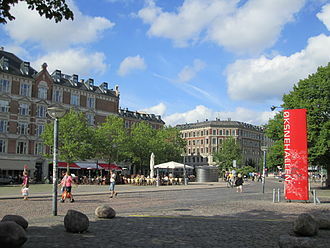 In 1671 a cattle market was established at the initiative of Court Butcher Niels Olufsen at the border of Frederiksberg. Called Trommesalen because it was opened to the sound of a drum in the morning, in 1878, due to shortage of space and fear of cholera epidemics, the City decided to construct a new cattle market. 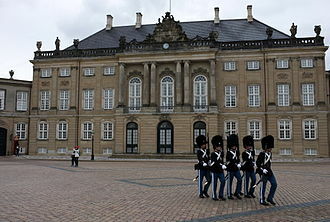 A municipal committee suggested a location at Kalvebod Beach, which at the time was situated where the square Halmtorvet is today, the site was located on the grounds of a large estate which the city had acquired from the Royal Copenhagen Shooting Society in 1870. The new cattle market was constructed partly on an area occupied by shooting ranges. The new market opened on 28 November 1879, planned and designed by architect Hans Jørgen Holm, the market, stretching from Halmtorvet to the gasworks harbour, was dissected by a broad internal road lined with cattle stables, sheep pens and dealers offices on both sides. In 1883, three slaughterhouse for cattle were constructed and a slaughterhouse for pigs and two slaughterhouses for cattle and lambs were added, the market area housed cooling houses and various rendering businesses like tallow melting houses and blood dryers producing blood meal. Carl Johan Bonnesen was a Danish sculptor. Carl Johan Bonnesen specialised in depictions of animals and exotic, primitive subjects as seen in the first sculpture he ever exhibited »A Victorious Group of Huns« from 1889. It was soon followed by »A Barbarian«,1891, »The Period of the Huns«,1893, »A Bedouin«,1897, at the age of 22 in 1891 his first sculpture was acquired by the collector Heinrich Hirschsprung and cast in bronze. His most important patron was the brewer Carl Jacobsen, who among other pieces ordered »Thor Driving Across the Arch of the Sky«, Bonnesen was born on 26 May 1868 in Aalborg. He first trained to become a carpenter for two years before moving to Copenhagen where he was admitted to the Royal Danish Academy of Fine Arts in 1887, there he studied under Theobald Stein and Christian Carl Peters before graduating in 1889. After completing his education, Bonnesen travelled extensively through the 1890s, from 1894 to 1895 he stayed in Paris where he was in contact with the circle around Stephan Sinding with whom he had more in common than he had with Stein and Peters, his former teachers. Vestre Cemetery is located in a large park setting in the Kongens Enghave district of Copenhagen, Denmark. With its 54 hectares it is the largest cemetery in Denmark, beautifully landscaped, it serves as an important open space, popular for people to take a stroll, and look at the old graves and monuments. It is located southwest of the city center, between the Enghave, Sydhavn, Sjælør and Valby train stations on Copenhagens S-train system, the cemetery is one of five run by Copenhagen municipality. The other cemeteries are Assistens Cemetery, Brønshøj Cemetery, Sundby Cemetery, the cemetery has a Catholic section, and next to that is a Jewish cemetery. Vestre Kirkegård was opened on 2 November 1870 to accommodate an urgent need for adequate burial places for the population of Copenhagen. Assistens Cemetery, till the cemetery of the city, had long been unable to cope with the increasing number of burials. First a burial place for the poor, Vestre Kirkegaard became the burial place during the 1990s. The cemetery is noted for its scenery, offers a maze of dense groves, open lawns, winding paths, overgrown tombs, tree-lined avenues, ponds. Many graves have distinctive gravestones, sculptures or large mausoleums and are eclectically placed, the cemeterys grounds boast a huge variety of trees with many rare species and is a heaven to birds and small mammals. Almost all the buildings in the grounds have been designed by Hans Jørgen Holm or Holger Jacobsen who succeeded him as resident architect for the Copenhagen Burial Services, Holm designed both the North Chapel and South Chapel as well as an office building the gate at the main entrance. It is unclear who were responsible for the design of the former inspectors house just inside the main entrance, the East Chapel was inaugurated in 1914 to a design by Holger Jacobsen but only remained in use until 1926. The Crossroads Project, designed by Schønher Landskab, is a project centred on the remains of the West Chapel. The complex is intended to serve a dual purpose both relating to the function as a burial place and as an open space and meeting place in the city.